A few years ago I stumbled across Youtube videos of a hilarious drag queen shopping around places like Target and World Market and I instantly became obsessed with all things Miss Coco Peru! Coco was everything I never knew I needed and I had to watch every single one of her videos and find out more about this absolute treasure of a person. If you are like I was and knew that Coco looked extremely familiar, it is because she has had a gag worthy 28 year career in film, television, nightlife and the LGBTQ+ community. You absolutely have seen her before in movies like To Wong Foo, Thanks for everything Julie Newmar, Trick, the cult classic Girls Will Be Girls and more. She has also been in television shows like Arrested Development, How I Met Your Mother and Will & Grace (both the original and most recently the reboot). I am beyond thrilled that Miss Coco Peru agreed to do a "5 questions with" for OJ&B because she sparks more joy in me than Marie Kondo feels in the middle of a hoarder's home. Check out Coco's interview below to find out how she got her name, what inspires her comedy, what it was like to have her own bar on the Will & Grace reboot, which celebs she would have over for a panettone and tension tamer tea and more! 1. How did you get the name Coco Peru? Coco Peru: Years ago, before I did drag, my first boyfriend was a Peruvian guy and I traveled to Peru with him where I met a drag queen named Coco who was quite famous and who had crossed over into the mainstream. Whereas being gay was a huge taboo there, it seemed to me that there was power in drag that people respected. I was very inspired that he was celebrated in such a Catholic and macho society. 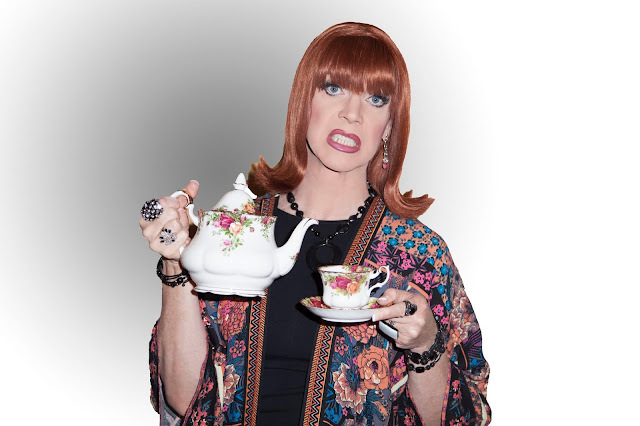 So, later when I decided to do drag myself, I called myself Coco Peru as I started to write my first show and the name grew on me and I stuck with it. 2. What inspires your brand of comedy? Coco Peru: The absurdity and ridiculousness of everyday life and surviving it. We all have that in common. 3. 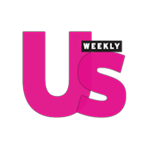 What was your favorite thing about having your own gay bar on the Will & Grace reboot and why can't this be a real place? Coco Peru: My favorite thing was that gorgeous neon sign of my wig that was made especially for that episode. I really felt like the producers, writers, set designer and prop department all took very special care to celebrate me. It was truly overwhelming and an honor to be a part of an iconic, game changing series and have them write me in as myself. I’m too old now to get into the club business but many fans wrote wishing that a bar like Miss Coco’s existed and I even had someone write that wanted to possibly invest and open a real one! 4. You have become an Internet and social media sensation! How did you discover that you where hilarious to shop with and why do you think the "Coco goes to" videos have been so successful? Coco Peru: It really all started off just as a joke. My manager and I saw that Target was selling a wig that looked like mine and we thought it would be fun for my fans to see me looking for it. We really had no idea that so many people would respond to it. I think it works because people love a “fish out of water” moment and I clearly don’t care what people think of me as I walk around, and I think a lot of young people find that empowering. People really seem to like my Bronx accent too and that I remind them of the aunt they always wanted! 5. What's next for Coco? 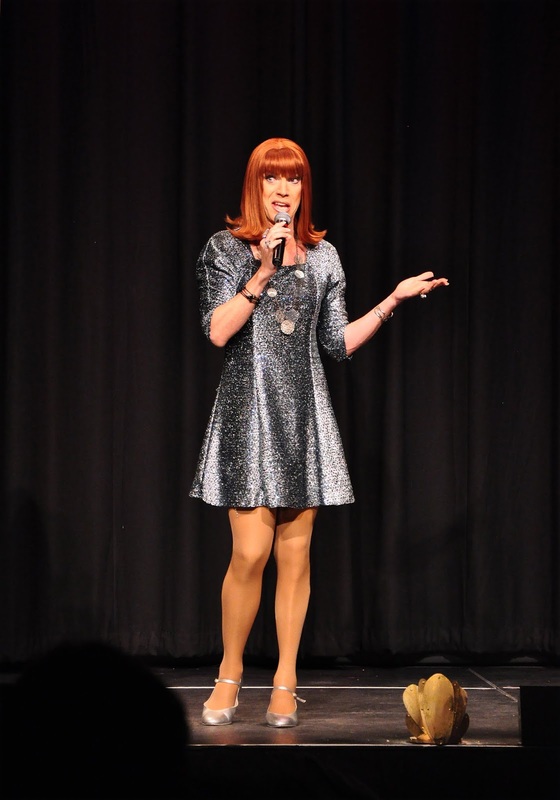 Coco Peru: I continue to tour with my one person shows and I really love when the people who only know me from YouTube get to see and discover what it is I really do. And what I’ve been doing for 28 years! Bonus Question: What celebrity would you have over for a panettone and tension tamer tea? Coco Peru: I miss Bea Arthur who I had the great fortune of being friends with, so I’d love to see her again. Also, Jesus Christ so I could ask him, “Honey, what were you really trying to say and was your mother really a Virgin?” I think he could clear up a lot of what’s been said in his name. So, Bea Arthur, Jesus Christ, and Coco Peru. Sounds like a tea party to me! Thank you so much again to Miss Coco Peru for taking time to do a "5 Questions With" for OJ&B! For more information on Miss Coco Peru go to misscocoperu.com and be sure to follow Coco on Instagram, Twitter and Facebook!